I’m using it for the second day now, and It’s really solid. I like it so far (sitting on Dev version). At least for my workflow, it works better than Chrome (less RAM consumption across the board). it’s exactly as bad as any other chromium clone, what about it is solid? It’s exactly as good as most of other chromium based clones. What about it isn’t solid? Like how I structure my question? Clearly, I’m dealing with a fanboy here. If Ad Block+ and/or UBlock Origin isn’t to be allowed in the new MS Browser… it’s a NO-GO from the very start. It is allowed, you can install uBlock Origin and any other blocker, plus everything that is available on the Chrome Web Store. uBlock Origin runs great in the new Edge. You can download it from the Chrome Web Store by toggling a setting on in settings. I believe a version of uBlock Origin is also available in the Windows store for Edge, but that version is out of date and hasn’t been updated in quite some time. Does it also allow NoScript Add-on?. This is one of may favorites and I have it on FF where I am enjoying every single bit of it. I know for a fact that Edge doesn’t allow it. What a pity! Am using the Dev version with AdBlock Plus right now. On Edge you can use Nano blocker beta, so maybe these essential extensions ( for me) will be allowed. I am used to start my browser with 2 tab: the official openings-page with the search window and a tab with all my favorites. If I go to the Favorites-tab and click a favorite, this favorite is opened in a new tab (so the 3-th tab). If I close this tab I go automatically back to my Favorites-tab, to choose another favorite. In MS Chromium-Edge the opened site overwrites the Favorites-tab. So at closing the favorite there is no Favorites-tab available anymore. I see this as very unconvenient. Also if you enlarge the font-size, in the Favorites-tab the text is not enlarged. Further CCleaner (and Glary and WiseCare) and SpywareBlaster do not recognize MS-Chromium-Edge. So for paranoid people a negative point. Most users will not require any custom configuration -simply install Firejail form the repository. Palemoon and Waterfox browser use all of Linux sandboxing security features. Chromium has its own sandboxing application but it too uses Google binaries. In use Chromium limits bookmarks as Google wants you to always search through them. They also plan to disable the use of ad-blockers. The best extensions run only in developer mode which have to be manually reinstalled when the browser is updated. With its design emphasis on data-mining and serving ads, the Chromium browser is on a terminal trajectory. I used Iridium for some time, it as a great browser but alas, it is very lagging in updating. Too much delay for me. Chrome has ad block integrated? Did anyone know anything about this? It just blocks ads on sites that don’t adhere to certain standards. Hola, yo lo estoy utilizando Edge Dev, y funciona realmente bien, es totalmente compatible con las extensiones de Crome, pero es más rápido en cargas de web y su aspecto si me gusta mucho, seguiremos esperando que mejore. The list of “removed” features by M$ is pretty misleading. These are not Chromium features, these are Chrome features that are added by Google to Chromium. It’s more of a list which invasive parts were replaced by M$-equivalents. As for Chromium browsers, I’m still on Iron, it gets more frequent updates than Iridium… But Firefox is certainly preferred. 1 scanner under virus total day it contains a virus. I’m trying this now for the last couple of days and really liking it. Not particularly a Chrome fanboy myself. but this feels very responsive and the ability to use add-ons from the chrome web store is definitely a plus. Holy molly that is a lot of points for data harvesting services included with Chrome, but it’s not spyware if it offers a useful service to the “nothing to to hide” crowd. Thanks Jeff, I’ve been using Sandboxie on windows for over a decade and it’s nice to see an equivalent for Linux. Wow, all that stuff! My stripped Chromium has maybe five of those things. 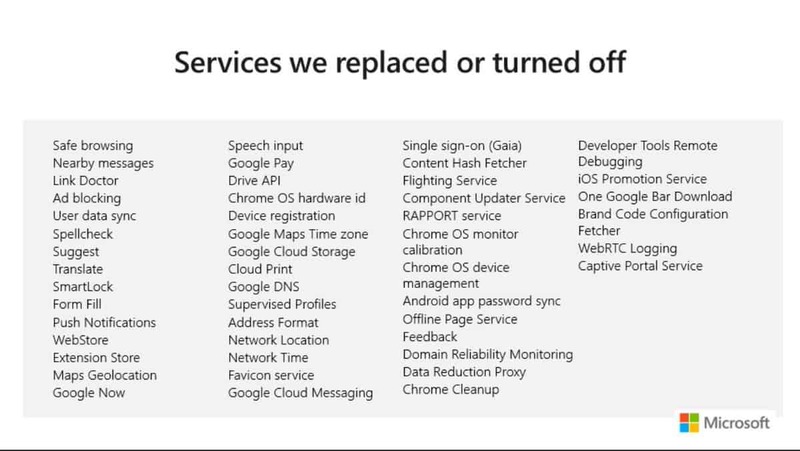 Interesting webRTC was replaced. Some of the more private chromiums lost a big chunk of their privacy when they determined webRTC could no longer be disabled. I’m sure MS wedged their version into Chromedegium but if it can be extracted maybe some decent chromiums will appear again. I doubt I’ll ever use this browser but it’s interesting to follow; doesn’t seem to be a rebranded chrome so far. Its a fast browser without all the Google junk that has been added over the years. Brings back memories to what Chrome used to be before Google began to muck it all up. Even after just a couple days of use, the Edge Chromium combination seems to be a good fit. Maybe a case for what Edge should have been all along. I think the Web needs to be rewritten. There’s just stacks upon stacks of things. Non standard video players and more. I myself would just like to turn Edge completely off and never have it running in the background. There is an app called “edge-block ” by Sordum that seems to work. Executables for Edge are kind of buried in App Data, wasn’t able to figure out how to firewall that. If I install this and uninstall it, is it going to get rid of Edge once and for all? Powershell doesn’t work for Edge, if this is working then I will install it. I will never use a Microsoft browser and their junk, they get enough data from me with Windows, so it’s Firefox for me. I would like to finally get rid of Edge, is this going to work? I think this is really a remarkable opportunity for Edge to deliver a Chrome competitor. For those who use Windows, it will be a no brainer to browse with the future Edge as well. If Edge also delivers on privacy and security (which I doubt at this point, it’s hard to beat Safe Browsing for example), it can definitely get a big fan base. Actually a very smart move from Microsoft I think. Initially, I was a little annoyed that yet another browser had fallen to the Chromium juggernaut, but after reading both the comments and the article, I had a moment where I thought “Ooh I might give Edge a go again”. It was really quite a shock to hear myself thinking such thoughts ; ) I believe this move may finally give Edge some traction. Whether I myself will end up using it on a day to day basis I guess depends on what MS replace and what they don’t. I’d probably like the option of adding back some of the features that they’ve removed as extensions/plugins (i.e. cloud print), but I like the idea of a ‘refreshed’, ‘lighter’ Chrome/Edge – especially given some of the recent design and configuration changes of Google’s fork. Options are good, and I’m glad that Edge seems to be finally becoming one. On a sillier note, I want to see the following as the title of an article – but only because of the initials from Chrome onward lol “Finally despite the previous dominance of Chrome or Vivaldi, Firefox, Edge Finally Emerges”.